Our USA side have an excellent story on how training pays off in saving a life. As a nurse, Nancy has been trained in CPR many times throughout her career. It was the day after her most recent re-certification that she was called upon to put her skills into use. And it hit close to home. Just a few weeks ago, Nancy and her family went out for Mother’s Day. During the meal, Nancy noticed her mother acting strangely. It then occurred to her that her mother may be choking. Thinking back to the CPR training she had taken only the day before, Nancy jumped into action and began the Heimlich maneuver and instructed her brother to call 9-1-1. Before he was able to call, Nancy’s efforts were successful and her mother began to breathe again. Nancy was able to remain calm in what would have been a very difficult situation for most of us. She explained that the actions just came naturally because of the training she had received. Reflecting on the whole experience, and looking back on all of her rescue efforts over her career, this time was different. “When it’s a family member, it kind of puts a new light on it,” she said. AED units, what are they and do they have to cost so much? 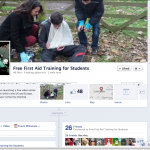 Copyright © 2019 Student First Aid Blog . All Rights Reserved.